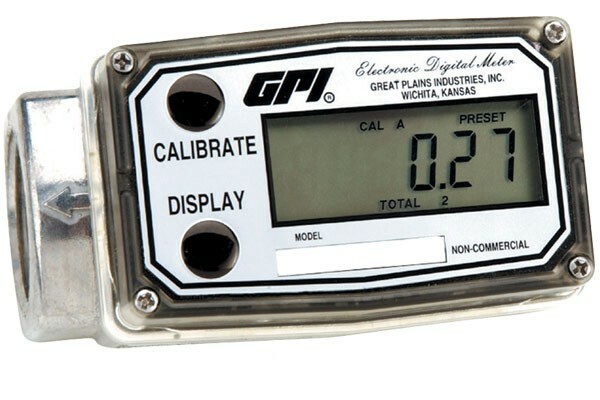 GPI 120000-17 FM-300HR is a simple, small and sturdy Electronic Digital Disk meter with rugged PBT Housing. Calibrated in gallons with 1" NPT fitting. It delivers from 2 to 20 GPM. It features an Easy-to-read LCD display. GPI 120000-15 FM-300HR is a simple, small and sturdy Electronic Digital Disk meter with rugged PBT Housing. Calibrated in litres with 1" NPT fitting. It delivers from 7 to 75 LPM. It features an Easy-to-read LCD display. GPI A1 nylon Commercial Grade Flow Meter is great for use with water or non-aggressive chemicals. Calibrated in gallons and litres with 1" fitting size. It delivers from 0.3 to 3 GPM ( 1-10 LPM). GPI A1 nylon Commercial Grade Flow Meter is great for use with water or non-aggressive chemicals. Calibrated in gallons and litres with 1" fitting size. It delivers from 3 to 50 GPM. 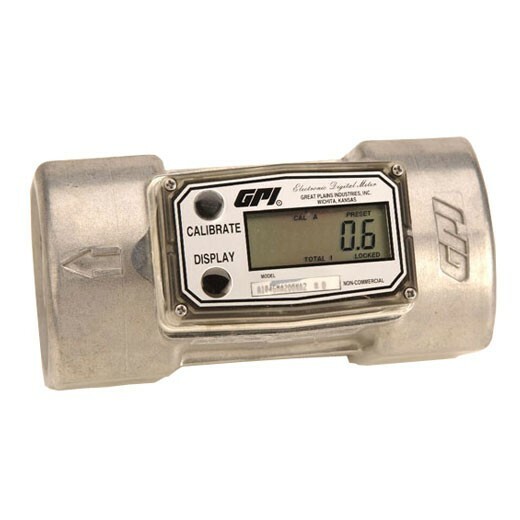 GPI 01N31GM is a great water and light chemical flow meter that can attach to the end of a hose or on an in-line pipe. Calibrated in gallons with 1" fitting size. It delivers from 3 to 30 GPM. GPI 01N31LM is a great water or light chemical flow meter that can attach to the end of a hose or on an in-line pipe. Calibrated in litres with 1" fitting size. It delivers from 10-100 LPM. 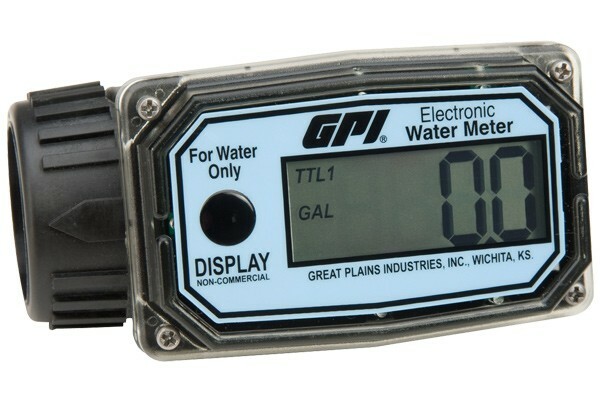 GPI 01N12LM is a great water or light chemical flow meter that can attach to the end of a hose or on an in-line pipe. Calibrated in litres with 1" ISO thread. It delivers from 3 to 30 GPM (10-100 LPM). GPI G2S05N09GMA Stainless Steel Meter has excellent chemical compatibility, is ideal for use with Ammonium, Plating Solutions and Fuel products. It is calibrated in gallons and litres with 1/2" NPT fitting, and delivers from 1 to 10 GPM. 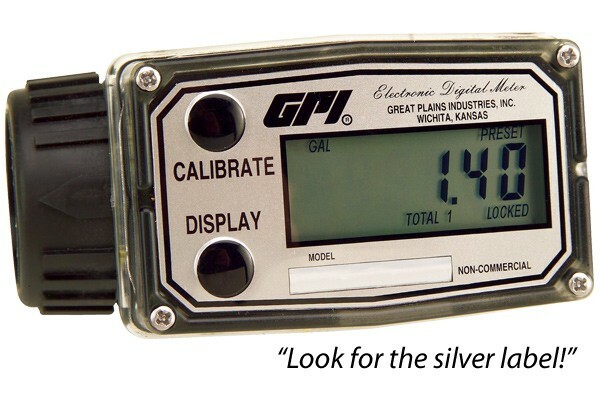 GPI G2S07N09GMA Stainless Steel Meter has excellent chemical compatibility, is ideal for use with Ammonium, Plating Solutions and Fuel products. It is calibrated in gallons litres with 3/4" NPT fitting, and delivers from 2 to 20 GPM. GPI G2S10N09GMA Stainless Steel Meter has excellent chemical compatibility, is ideal for use with Ammonium, Plating Solutions and Fuel products. It is calibrated in litres with 1" NPT fitting, and delivers from 5-50 GPM. GPI G2S15N09GMB Stainless Steel Meter has excellent chemical compatibility, is ideal for use with Ammonium, Plating Solutions and Fuel products. It is calibrated in gallons and litres with 1-1/2" NPT fitting, and delivers from 10 - 100 GPM. GPI G2S20N09GMB Stainless Steel Meter has excellent chemical compatibility, is ideal for use with Ammonium, Plating Solutions and Fuel products. It is calibrated in litres with 2" NPT fitting, and delivers from 20 to 200 GPM. The GPI G2H07N09GMA is the turbine meter of choice for high pressure applications like spray washers and hydraulic systems, can perform in all kinds of high pressure applications. It delivers from 2 to 20 GPM with 3/4" NPT fitting. The GPI G2H10N09GMA is the turbine meter of choice for high pressure applications like spray washers and hydraulic systems, can perform in all kinds of high pressure applications. It delivers from 5 - 50 GPM with 1" NPT fitting. The GPI G2H15N09GMB is the turbine meter of choice for high pressure applications like spray washers and hydraulic systems, can perform in all kinds of high pressure applications. It delivers from 10 - 100 GPM with 1 1/2" NPT fitting. The GPI G2H20N09GMB is the turbine meter of choice for high pressure applications like spray washers and hydraulic systems, can perform in all kinds of high pressure applications. It delivers from 20 - 200 GPM with 2" NPT fitting. The GPI G2S10F09GMD flange meter is easily installed and removed with four bolts. This stainless steel meter has excellent chemical compatibility. It delivers from 50 - 50 GPM with 1" ANSI Flange fitting. 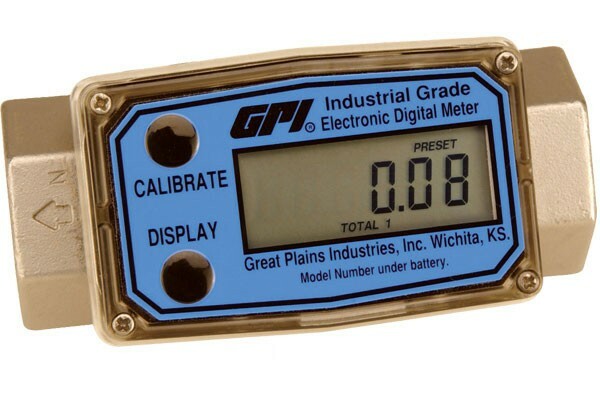 The GPI G2S15F09GME flange meter is easily installed and removed with four bolts. This stainless steel meter has excellent chemical compatibility. It delivers from 10 - 100 GPM with 1 1/2" ANSI Flange fitting. 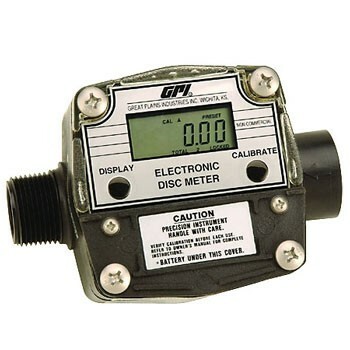 The GPI G2S20F09GME flange meter is easily installed and removed with four bolts. This stainless steel meter has excellent chemical compatibility. It delivers from 20 - 200 GPM with 2" ANSI Flange fitting. GPI G2A10N09GMA Aluminum Flow Meter is best suited for petroleum based products. It is calibrated in gallons and liters with 1 inch NPT. It delivers from 5 to 50 GPM (18.9 to 190 LPM). GPI G2B05N09GMA Brass Turbine Flow Meter works well with most water applications, use with glucose, lacquer thinners and vegetable juices. It is calibrated in gallons and liters with 1/2 inch NPT. GPI G2B07N09GMA Brass Turbine Flow Meter works well with most water applications, use with glucose, lacquer thinners and vegetable juices. It is calibrated in gallons and liters with 3/4 inch NPT. GPI G2B10N09GMA Brass Turbine Flow Meter works well with most water applications, use with glucose, lacquer thinners and vegetable juices. It is calibrated in gallons and liters with 1 inch NPT. GPI G2B15N09GMB Brass Turbine Flow Meter works well with most water applications, use with glucose, lacquer thinners and vegetable juices. It is calibrated in gallons and liters with 1 1/2 inch NPT. GPI G2B20N09GMB Brass Turbine Flow Meter works well with most water applications, use with glucose, lacquer thinners and vegetable juices. It is calibrated in gallons and liters with 2 inch NPT. The GPI GM002A2C41-5 Oval Gear Pulse Meter with 1/4" NPT fittings can handle a wide range of fluid viscosities. It delivers from 0.53 - 26.4 GPH (2 - 100 LPH).